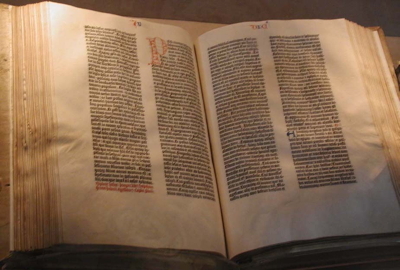 The Gutenberg Bible is the oldest printed book in the west, printed around 1454-1455 AD. Think about strong, permanent things. What are they made of? How big are they? I think of stone structures that stand for centuries. I think of sequoia trees and mountains. When we want to build something that lasts forever, we consider materials even stronger than stone and wood—metal alloys and other synthesized compounds. We design it to stand tall, go deep, and have protective reinforcements. The stronger it is, the more permanent it becomes. We’ve learned that strength and resilience can also be found in the most unexpected places. Earlier this year, scientists learned that the strongest known biological material on earth is found in the tooth of a sea snail, and can withstand more force than Kevlar. Previously, this record has been held by spider’s silk. With this in mind, we can look at this week’s lesson and wonder. What makes the Bible so permanent? It’s ink and paper. It’s flammable. It tears easily, and it’s certainly not bulletproof. What makes this book so special that it can be made of the most fragile materials and still last for so long? Neil Gaiman, a favorite author of mine, wrestles with this idea in the introduction to his collection of short stories called Fragile Things. All earthly materials have a limit, whether they’re biological or synthetic. Natural forces and events wear down human-made structures over time, and all matter eventually decays. But as we see in this lesson, the Bible has withstood even complete destruction and still remains a life-changing force for humanity. God’s words, written by Jeremiah, should have perished as soon as they were turned to ash, but they didn’t. Later, Luke retells the crucial bits of countless stories that otherwise might have faded over time. These are the stories that have outlasted all the people who told them. This unit will ask us to explore the minutiae of the Bible as a physical, fragile thing, so we can consider its power as it both lives and directs our lives. • What is the oldest story you can think of? How is it similar and different from the Bible? • How would you describe your relationship with the Bible? • Which parts of the Bible do you usually pay attention to? Which parts do you usually gloss over? At times the Bible has appeared as an instrument sustaining a status quo in the hands of oppressive establishments, sometimes with support from established religious groups that wish to freeze and canonize inequalities of resources, position, power, and dignity. Yet the Bible ahs also provided the foundations for radical critiques of human power structures, issuing a call for the recognition of the fundamental dignity of each man and woman as created in the image of God. It has given to some a compelling vision of humanity as sons and daughters of God and thereby ideally brothers and sisters. Is the Bible an oppressive residue of a patriarchal past, so rooted in certain male-dominated visions of human life and relationships that it is best jettisoned as we move to a new age informed by a richer vision of the human being as both male and female? Or are there vital, if neglected, resources in the Bible for this new vision, images of God as maternal as well as paternal, that call into question all structures supportive of inequalities and indignities rooted in race, gender, or any other dimension of the richness of being human? This diversity of perspectives illustrates what a complex process reading itself actually is when perceived as the active interplay of three forces: an author, a text, and a reader. All of the readings cited above are exercises in power, human power that can be creative or dangerous, especially when the complexities of reading are not recognized. Traditionally interpretation has centered on the text itself as the bearer, often on several levels, of spiritual insights and truths. Sometimes the Bible was mined for support of doctrines and morals already shaped. In time, critical historical and literary study of the Bible came to center on the message intended by an original author addressed to his or her particular sociohistorical context. More recently critical emphases have emerged that once more center on the text itself, independent of the author (and of course all authors at one point or another must set their work free), and on readers are more than passive vessels into which texts pour information. The experience of an encounter with a text is shaped significantly by the perceptions and perspective of readers; it is an exercise in the making of meanings. Our readings reveal us, even as they reshape us. For some the experience of powerful texts calls forth what might otherwise remain unconscious values and perceptions, and this can be at once an experience of liberation and radical judgment. W. Lee Humphreys, “Bible and Liberation Movements,” Mercer Dictionary of the Bible, ed. Watson E. Mills et al. (Macon GA: Mercer University Press, 1990), 103.